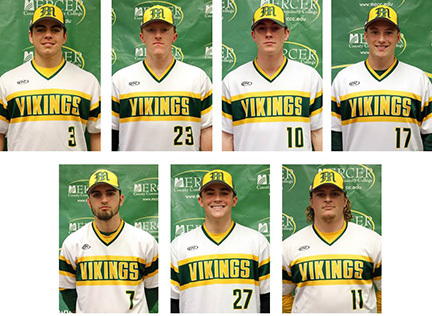 Seven members of the 2018 MCCC Vikings baseball team were named All-Region 19. From top, left: Dom Boselli, Ciaran Devenney, Sean McGeehan, Chris Mormile. Bottom, from left: C.J. Schaible, Collin Sheehan, and Jimmy Versage. WEST WINDSOR – Seven Mercer County Community College (MCCC) baseball players have been selected for post-season honors, claiming the majority of the spots on both the National Junior College Athletic Association (NJCAA) All-Region 19 and All-Garden State Athletic Association (GSAC) rosters. Pitcher C.J. Schiable, with 47 strikeouts in 50 innings and a 3.06 ERA, was named to the Division II All-Region 19 First Team, as was battery mate Ciaran Devenney, who batted .336 with nine home runs. Joining them on the first team is outfielder Sean McGeehan, a .319 hitter with nine home runs and 17 stolen bases, and utility man Colin Sheehan, a .373 hitter with 28 RBI in 42 games. With 84 strikeouts – averaging more than 12 per game – pitcher Chris Mormile claimed a spot on the All-Region 19 Second Team, as did infielder Jimmy Versage, a .375 hitter who slugged .777 for the season. Outfielder Dom Boselli, a .323 hitter with eight home runs and 48 RBI in 50 games, claimed the final spot for the Vikings. All seven were named to the Division II All-GSAC Team, with Versage joining Schiable, McGeehan, Devenney, and Sheehan as first-team selections. Boselli and Mormile were named to the All-GSAC Second Team. The Vikings concluded the 2018 season with a record of 27-19-1 and for the third consecutive year, claimed the Region 19 championship. This is the fifth consecutive year that six or more Vikings have been named to the All-Region 19 Team.